Franklin G. Adams was born at Rodman, Jefferson County, New York, on May 13, 1824. He attended local school and at age 19 went to Cincinnati with an older brother. There he taught in the public school and eventually graduated in 1852 with a law degree from what is now the University of Cincinnati. Adams was interested in the Kansas-Nebraska Act and joined a party from Kentucky, which reached Kansas Territory in March 1855. They founded the Ashland colony in Riley County. Adams returned to Ohio where he married Harriet F. Clark in Cincinnati on September 29, 1855, and he continued to teach school. They moved to a farm near Pilot Knob, Leavenworth County, Kansas Territory, in April 1856. Their daughter, Abzuga Adams, was born in Atchison County in 1959. Adams was forced to flee to Lawrence for protection at one point during an attack by proslavery men. 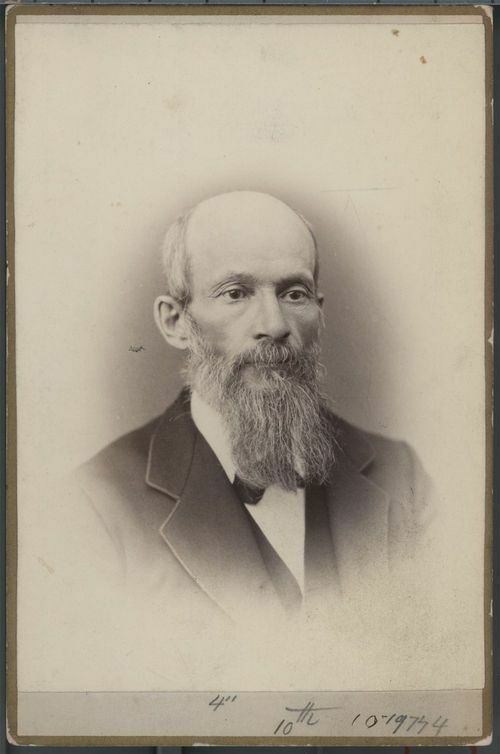 Adams became active in the Free State Party in Atchison and was elected to serve in the Leavenworth constitutional convention party. He was elected probate judge in 1858, and appointed register of the land office at Lecompton in 1861. Then in September he moved the office to Topeka and held that position until 1864. In Topeka Adams was associated with various publications including the Squatter Sovereign, Topeka State Record, Kansas Farmer, Atchison Free Press, and Waterville Telegraph. He was active in the formation of the Kansas State Agricultural Society, and secretary of the Kansas Fair Association, which held its first event in Atchison in 1863. Adams returned to Atchison to be the U.S. agent to the Kickapoos. In 1870 he moved to Waterville, Marshall County, and three years later published "The Homestead Guide," giving the history and resources of northwest Kansas. In 1875 he returned to Topeka, and in February 1876 was appointed to serve as secretary of the newly formed Kansas State Historical Society. Adams devoted much of his life to building the Historical Society’s collections. Adams died on December 2, 1899, and was buried in Topeka, Kansas.